In the previous session, we finished up the List Cars screen. Now we are going to make this screen the default screen, as well as make the New Car screen available for the user to navigate to. When you click on your Cars app, you are brought to the New Car screen. This is not standard practice, however. Clicking on the app should take you to a list of your cars. To change this in our app, we will need to change the starting screen. 1. 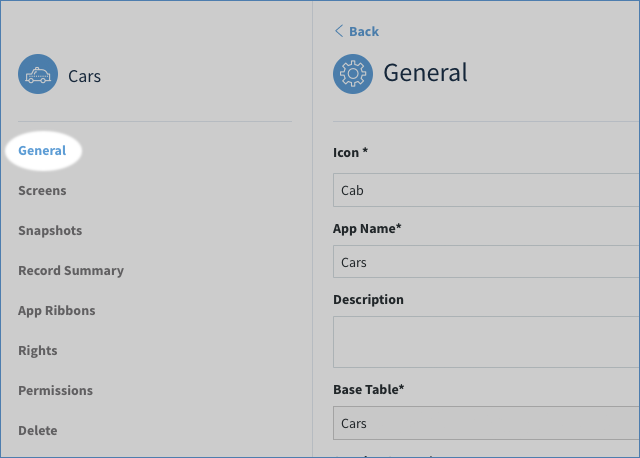 Click the vertical ellipsis ( ⋮ ) of the Cars app, and select Manage link. 2. Within the app menu, select General. 3. You will find a drop down labelled Starting Screen*. Change this to Cars List. Simple! Clicking on the app will now take you to the Cars List screen. Of course, how can we get to the New Car screen? You can use a snapshot! Snapshots are links provided on the app and its contextual menu. We are going to create a snapshot that will bring the user to the New Car screen. 1. If not already editing the Cars app, click its vertical ellipsis ( ⋮ ) and then select Manage. 2. On the menu on the left, select Snapshots and then click Create Snapshot. 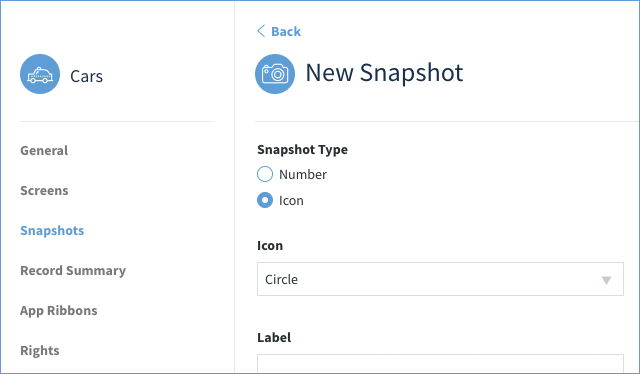 This will present you with a set of options that will allow you to configure our first snapshot! 3. Since we want to make this a simple shortcut to add a new entry, choose the Icon option. 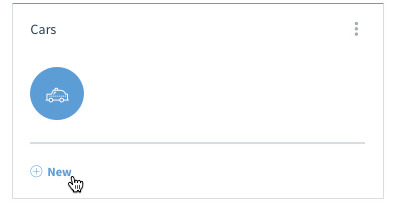 Within the icon dropdown, find the circle plus "⊕" icon. Note: If you’re creating a shortcut to an Add New screen of any kind, Method best practice is to use the ⊕ icon, which is what we’ll be doing here. 4. The Label is a required field that tells the user what this snapshot is for. Let’s label this one “New”. 5. Go To Screen denotes what screen the snapshot will take you to when you click it. Choose “New Car”. 6. The Position is where the snapshot will appear on the App itself. Choose "Left". 7. When you are satisfied with your options as pictured below, click Save. 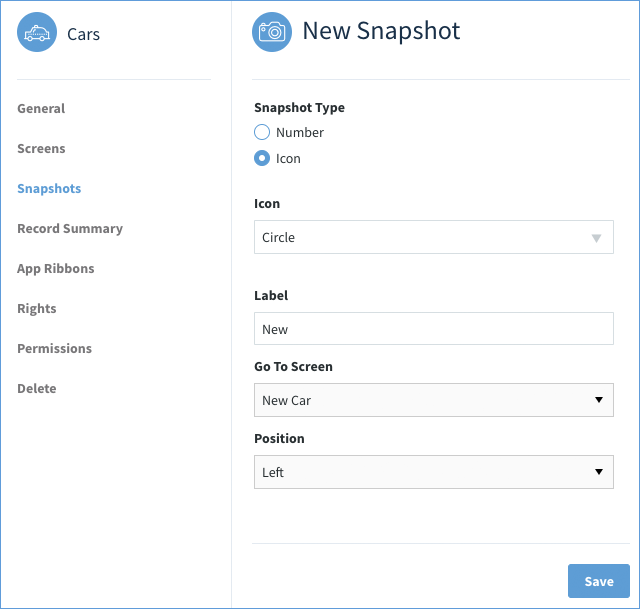 Navigate back to your dashboard and you’ll see your new Snapshot is now available to be used on your Cars app! If you click on it, it will take you to your New Car screen - which is still blank for now - but your shortcut works! Huzzah! Mission 2 is complete! In Mission 3, we’re going to make all the buttons and link work.